- 殘編 (Tanya Hsu) on 三月 5, 2016. On Thursday, February 25, Toronto’s foodies all gathered at the St Lawrence Market’s south tent to Party for the Future of Food, FoodShare’s Recipe for Change 2016 fundraiser. Sticking to a winning formula, Recipe for Change 2016 offered tasty ingredients from long time chef partners and supporters, mixed with a healthy dose of flavours from hidden gems and new restaurants. Guests were given utensils and a glass with presenting sponsor Tangerine Forward Banking’s logo printed on it. They had three hours to try signature dishes from a total of thirty top chefs paired with VQA wines and beer. This year’s event was designed to please both carnivores and vegetarians, many of the chefs also offered dairy free and gluten free options. Vegetarians enjoyed creations like Ricky Casipe of Hawthorne Food & Drink’s bread stuffing “double down” with smoked Monforte chevre and mushroom gravy, Daniel Schick of The Omni King Edward Hotel’s spiced chickpea flatbread with roasted squash, eggplant caviar and coriander cress, Luis Velasquez of Familia Fine Foods’ secreto andino (quinoa ball on plantain with guacamole), and Lorena Ramos of Latin Taste’s quinoa tamalitos (gluten free veggie tamales with fresh cheese). For the meat lovers, the party was absolutely three hours of heaven. Amanda Ray of Biff’s Bistro served chermoula braised lamb with labneh, socca, Biff’s pickles and sauce verte; Pork Ninjas had a taco bar featuring toppings like 18 hour hickory smoked pulled pork, 24 hour hickory smoked beef brisket and spicy fire-roasted peppers and tomatoes; Therese De Grace of The Good Earth Food and Wine Co. prepared smoked boneless beef short rib tostadas with Lee’s Ghee; Daniel Cancino of Lamesa Filipino Kitchen made coconut pork adobos with coconut guacamole and pickled vegetables on a shrimp chip. Creative dishes included Nick Liu of DaiLo’s Big Mac Bao, a big mac in a steam bun form with ground beef, house processed cheese, pickle, lettuce, potato and the chef’s secret sauce; Bashir Munye of My Little Dumplings’ BushBeck farm lamb and chickpea with harissa and za’atar wrapped into a dumpling, and Steffan Howard of Palais Royale Ballroom’s Great Lakes whitefish and balsam fir fish fumet finished off with fish skin sand. 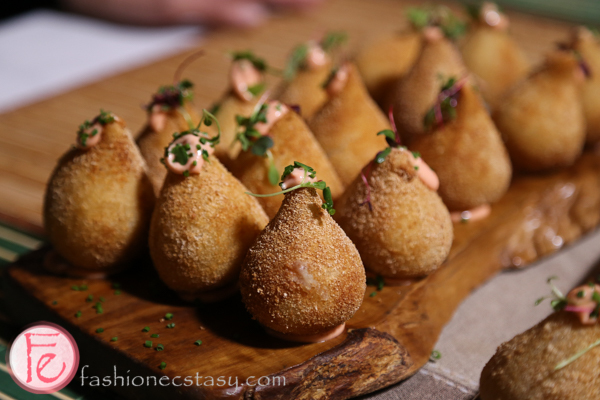 For those who were craving for deep-fried bites, Steve Fernandes’ coxinha (Brazilian chicken croquettes) was great with Mata Petisco Bar’s house made hot sauce. Seafood lovers indulged in east and west coast oysters shucked by Kristin Donovan of Hooked, cod fish empanaditas by Lorena Ramos of Latin Taste, and my personal favourite, Donna Ashley of Karelia Kitchen’s smoked seafood stew: smoked shrimp, smoked eel, clams and mussels cooked in a light fish broth and garnished with brioche crouton and smoked paprika rouille. 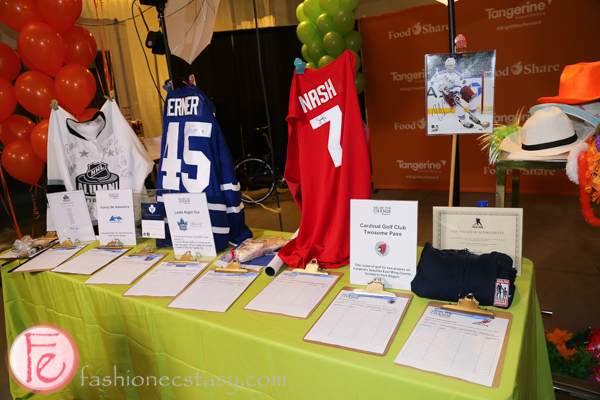 Guests who needed a break from all the eating were able to browse through and bid on priceless silent auction items like Steve Nash Team Canada and NHL alumni autographed jerseys. Handy kitchenware like KitchenAid stand mixer, Le Creuset Dutch oven and Jamba Super Chute juicer were also available for bids. 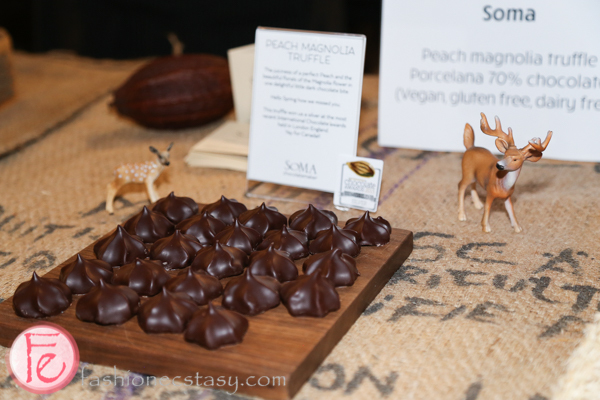 After burning some calories off placing bids and posing for the photo booth, diners returned to their mission stuffing their faces with sweets like Sandra Abballe (Succulent Chocolates and Sweets)’s chocolates and Cynthia Leung and David Castellan (SOMA)’s award-winning Peach Magnolia Truffle. Sanober Motiwala (Sweet Sammies)’s tiramisu affogato featuring Propeller Coffee worked like a Red Bull after all the wines and beers. FoodShare is a non-profit distribution hub and innovative community food education centre with a vision of creating a world with healthy food for all. It provides resources and programs that reach over 155,000 people per month in Toronto to help build a resilient and sustainable food system. Some of them include cooking classes, baby and toddler nutrition workshops and partnerships with communities experiencing food insecurity. Recipe for Change is FoodShare’s annual fundraiser and this year’s event supports food literacy by collecting needed funds to teach thousands of children in school how to cook and grow food. Other programs supporting the cause include Student Nutrition facilitating school meal programs, Field to Table Schools with exciting hands-on curriculum-linked activities, Good Food Café serving students nutritious food, and Bulk Fresh Produce for Schools and Community Groups selling affordable fresh fruits and vegetables.